On October 29, 2018, SOS Children's Villages Georgia, hold presentation of the Family Strengthening project "Achievements and Challenges”. National Director - Mr. Zviad Berdzenishvili talked about the establishment of the association and how SOS Children`s Villages were built in 1989. 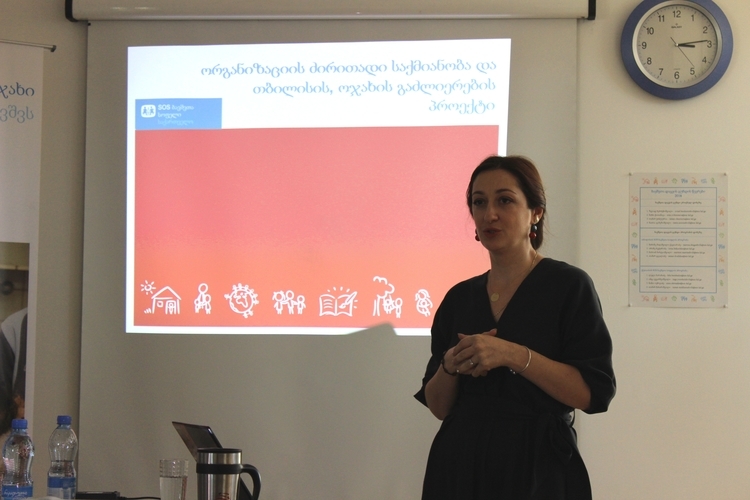 Ms. Marina Shagashvili - Director of SOS Children's Villages Program Tbilisi- briefly reviewed the Alternative care and Family Strengthening programs. Ms.Tamar Dvalidze - project coordinator, shortly reviewed Family Strengthening Project. It was started in 2007 and initially intervened in Vake-Saburtalo district in the beginning, the target group was refugees and socially vulnerable population. In 2009 new services were added to the project such as: psychologist, support with the employment and medical care. In 2010, an external survey was conducted on the basis of which the work location of family strengthening project was moved to Isani-Samgori district, as more needs were revealed in this district. Since 2013, Mother and Child shelter has been added to the services. Project Coordinator Ms.Tamar Dvalidze also talked about the main services of the project, such as: social work, psychological service, professional training and support in the employment, free educational classes, therapeutic and cognitive activities for children. The presentation was attended by Head of Social Projects Division of Isani District Board – Ms. Tamar Pruidze, Head of the Guardianship and Care Unit of Social Service Agency. – Ms. Eter Tskhakaia, Head of Educational Resource Center of Isani-Samgori District – Ms. Megi Rostiashvili, representatives of Polyclinic # 19 Ms. Gvantsa Beruashvili and Mr. Giorgi Nutsubidze. According to Ms. Eter Tskhakaia, SOS Children's Villages Georgia has been a reliable partner for the Social Service Agency for years, "the professional team with whom it is always pleasant and effective to work" - she said. Isani district representative Ms.Tamar Pruidze expressed her positive attitude towards the organization, said that the association really helps the exact target group which really needs the services, she also emphasized that it is really valuable to give a long-term, sustainable and results-oriented support to families. She also mentioned that she is ready to continue cooperation between the board and the association. Educational Resource Center representative Ms. Maggie Rostiashvili also expressed her great sympathy and positive attitude towards the association, said that over the years she was aware of the association's activities, however, this presentation gave her much more positive mood about the organization. She mentioned, that she is ready for any kind of help and support this project within her competence.